One of the greatest quarterbacks in Texas high school football history is sticking with the sport that he loves most. 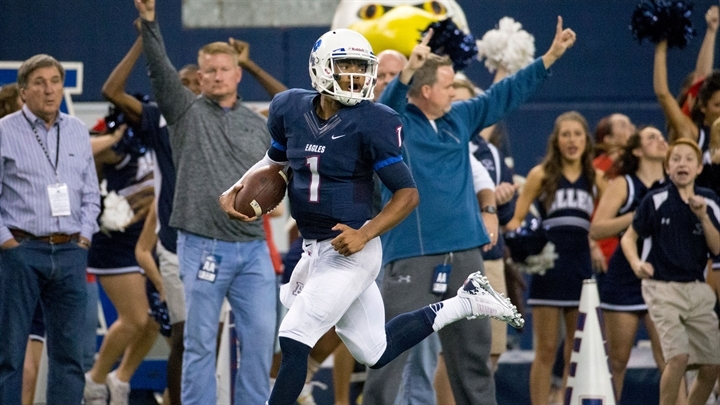 Former Allen quarterback Kyler Murray will commit full-time to training for the NFL draft and forego his contract with the Oakland Athletics. Murray was drafted No. 9 overall by the A’s in the 2018 MLB Draft. “Moving forward, I am firmly and fully committing my life and time to becoming an NFL quarterback,” Murray wrote in a statement. As part of his decision, Murray has to pay back $1.29 million of the $1.5 million that the Athletics paid him as part of his signing bonus. He will not receive the remaining $3.16 million that Oakland was expected to pay him on March 1. The A’s will put Murray on the restricted list and retain his rights should he ever decide to play baseball again. The team will not receive a compensatory draft pick for their first round pick not signing. The allure of football has long dominated Murray’s life. He was a record-setting quarterback at Allen High School, when he led the Eagles to three state championships and a 43-game winning streak. In a standout senior season, Murray completed 64.2 percent of his passes for 4,715 yards, 54 touchdowns and just seven interceptions. He added 1,498 rushing yards and 24 touchdowns on 9.9 yards per carry. Despite his listed 5-foot-10 height, recruiting services listed him as a consensus five-star quarterback. He proved those people right by winning the Heisman Trophy in his final season. Murray signed with Texas A&M out of high school as the crown jewel of Kevin Sumlin's 2015 signing class before transferring to Norman. Murray continues a strong wave of quarterbacks from the state of Texas to win the Heisman Trophy. The junior was the fourth Texas high school football quarterback to win college football’s highest honor since the 2011 season, joining Robert Griffin III, Johnny Manziel and Baker Mayfield. Because of his tremendous athleticism, many have pegged him as a running quarterback. In both high school and college, Murray proved that he could function as a pocket passer. Murray’s 2018 season at Oklahoma ended with a 69 percent completion percentage, 11.6 yards per pass attempt, a 6-to-1 touchdown-to-interception ratio and a 199.2 passer rating. The passer rating broke Baker Mayfield’s record. However, Murray gives up plenty of guaranteed notoriety by giving up on the MLB. Baseball has guaranteed contracts, and the A’s promised Murray more than $4 million just for signing. He likely would be one of the faces of the sport if he made the major leagues quickly. There’s no assurance that Murray will be a first round pick in the NFL draft. After the first round, the amount of guaranteed money in the NFL drops dramatically. Murray understands those risks. Even though Murray was the best player in college football, NFL draft analysts are tentative to put him at the top of the board. SB Nation, CBS Sports and Bleacher Report all project Murray as the third quarterback off the board, behind Ohio State’s Dwayne Haskins and Missouri’s Drew Lock. All project him to the Miami Dolphins. “I eagerly await the opportunity to continue to prove to NFL decision makers that I am the franchise QB in this draft,” Murray wrote. Murray will participate in Oklahoma’s pro day on March 13 in Norman, Okla., and in the 2019 NFL Combine. Quarterbacks participate in on-field drills on March 2 on the NFL Network.